I had a busy week at the computer. I finally finished the handout for the Finishing Class I am teaching at the Grand Retreat. If I do say so myself, it is one of my best. It is very complete and has lots of photographs illustrating the techniques. That was what took so much time. I think the attendees will be pleased. Someone suggested I add tags to my postings. I am so new to all of this I wasn't even aware that I could do that. Jan very nicely has added them to my past posts and I will do this from now on. Also, when I get back from the Grand Retreat, I will add a page as an index to the tips. Please feel free to give me suggestions. I would like this blog to be as useful as possible! I had lots of lessons to review this week. I am glad to see that students are completing the course. I really enjoy teaching correspondence courses. I had one student (Elissha) who completed two lessons in one week. Not to put pressure on the rest of you! I should mention that Elissha lives in neighborhood! You can thank Abigail on Ravelry for the topic. 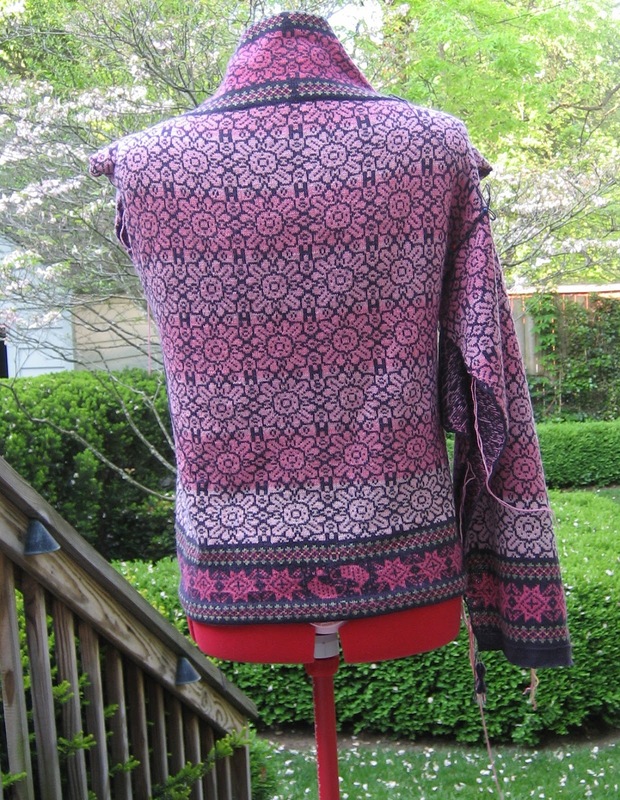 By the way, if there is a topic you are interested in, let me know, either through Ravelry or send me a comment. I can't make promises but I'm pretty flexible about the topics. You have a choice with how to weave in ends in Garter Stitch. 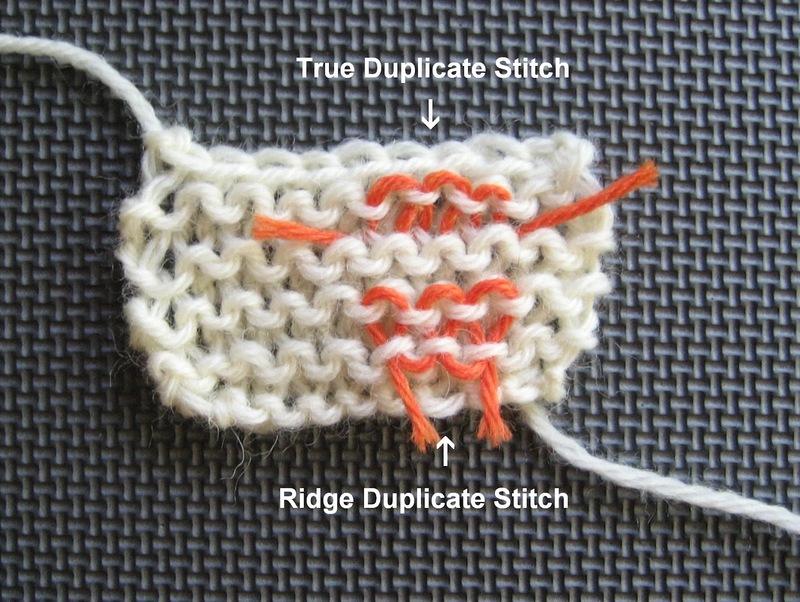 You can use true duplicate stitch or duplicate stitch into the ridges. Garter stitch, when worked on needles appropriate to the weight of the yarn you are using, should be a dense fabric. The ridges should be close together. 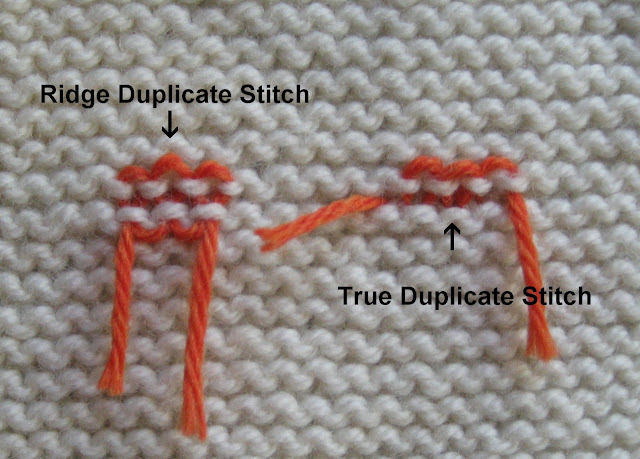 This makes true duplicate stitch difficult. In duplicate stitch you follow the path of the yarn on one row. 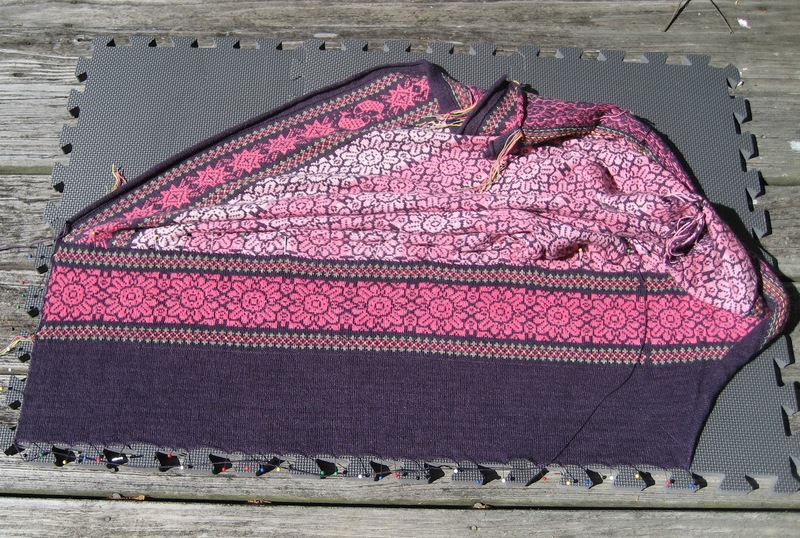 It is hard to see the bottom of the stitch. Weaving into the ridges is much easier. Which method you use depends on what the piece is going to grow up to be. If it is a swatch, using the ridges is fine. If it is for a garment you may want to consider true duplicate stitch. Garter stitch is heavy and in a coat for example, it might stretch quite a bit. The ridge method does not allow for stretch quite as much. For the photographs I did for the Finishing Class, I worked the swatches on Size 11 (!!!) needles so the stitches are more visible. I did the same for this tip. The following photograph DOES NOT REPRESENT good tension for Garter Stitch! It is a little easier to see the true duplicate stitch in this photograph. If you use this method, you should slightly split the stitches, particularly on the bottom or it will show through on the RS. If you use the ridges, it is invisible on the front. Salon will be on Saturday. The operas are over for the season. They rebroadcasting the Ring in May. I plan to see them again. I'll miss Rheingold since I will be in Mackinac but I should be able to see the rest. I have finished all the knitting for the Decoration Day sweater. I thought the front band would kill me. I didn't think I would ever finish it. Blocking it was tricky. I could only do one side at a time. The band folds over. It is 10 inches wide. Not surprising that it took so long to knit. 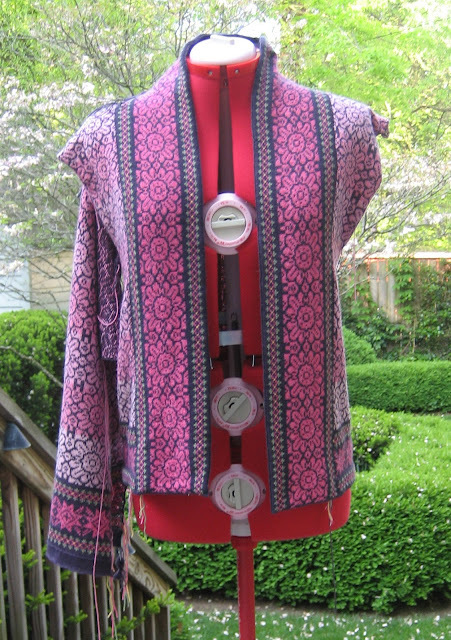 I've finished hemming the front and bottom bands. I have one sleeve almost half way seamed in place. I took a photo anyway. When the sleeves are in place I just have to weave in the ends. I might do a final blocking...We shall see. I notice in the photos which followed that I didn't put it on the mannequin so that it was lined up on the front. Trust me, it is perfectly even. Notice the bottom edge. You think I would have noticed! Here's the back. I followed my own advice. 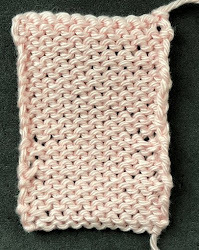 I always tell knitters to do the gauge swatch for their next project before they complete finish their current project. 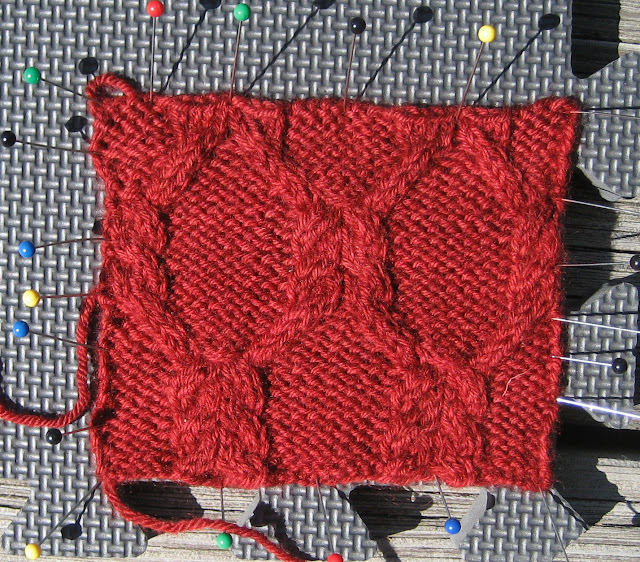 I did the gauge swatch for the Vlad Pullover. I am so lucky that the photo shoot for the Fall issue isn't until May 16th. I have time to get this sweater done. After this one (on Size 0 needles and a stitch gauge of 11 stitches for 1", it will be a breeze...Size 5 needles!